NOTE: Ishukone-Raata is a Roleplay Business Organization. We’re looking for those inclined to immerse themselves into the rich setting that is EVEonline. Don’t know the lore? We’re here to help new and old players alike. So come join us on our continuing efforts. Founded in 2009-02-12, the Ishukone-Raata Enforcement Directive, and her children corporations were formed as a capsuleer subsidiary belonging to the Ishukone Corporation. The Enforcement Directive’s mandate consists of a multitude of operations, ranging from the survey of frontier prospects, obtaining and securing resources, and defending Ishukone assets & interests. The Ishukone-Raata Enforcement Directive is looking for dedicated employees/pilots who function well with others, can handle stress, and show respect for professionalism. Commitment, Integrity, and Reliability are the three standards we work by. We work to create a safe viable environment for Combat Pilots, and Industrialists looking for something bigger than themselves by operating for Ishukone Corporation on the fringes of lawful space. A capsuleer organization closely associated with the Ishukone Corporation, I-RED often performs various functions on behalf of Ishukone or with the support of Ishukone while maintaining its autonomy. Some of the operations we perform include: prospective surveying, resource protection and extraction, and asset defense for Ishukone and Caldari State property. Our Enlistment Program offers you the choice of employment. Where you fit is up to you. The official internal news division of I-RED, the I-RCN acts as the primary source of news both inside and outside the organization. I-RCN covers many aspects of daily life relevant to the baseliner employees of the alliance, but also serves the important function of communicating important events to the greater public. The Ishukone-Raata Corporate Investment Bank (I-RCB) acts as the administrative branch of the organization. The bank oversees the daily transfers of billions of ISK to and from the various branches of I-RED, in addition to the bank and baseliners who make use of its services. The bank offers a variety of services to baseliner clientele, including but not limited to: life insurance, employment benefits, loans of all types, investment opportunities, and traditional currency storage. Recently established, the Ishukone-Raata Technological Research Institute is responsible for the continued development of new and improved technologies. Scientists within this division of I-RED are supported and encouraged in their specialized fields of study, provided there is no breach of ethics, and results are made available without restrictions to I-RED. Public services such as medical evaluations (both physical and psychological) are available to baseliners and capsuleers by appointment only. – The I-RTI is also known to act as the exploration wing within Ishuk-Raata. By far the largest and most expansive branch of I-RED, Ishukone-Raata Accounting and Transport (I-RAT) functions in a myriad of roles: general personnel management, logistics operations, custodial duties of infrastructure, and more. I-RAT oversees the management of the civilian population of the organization, and this includes non-employees who operate within or in close proximity to I-RED property. This is also the corporate division that oversees the planetary and interstellar logistics of I-RED as a whole. Without a doubt I-RAT is an essential branch of the organization. I-RED’s Department of Internal Affairs, its mandates include the control of I-RED’s armed peacekeeping forces, formerly under joint oversight of Human Resources & Defense. This branch oversees security services within the organization, often deploying to secure assets belonging to Ishukone, the State or the various branches within I-RED. We at Ishukone-Raata hope you decide to enlist your services with us. Should you have further questions you may contact me at your earliest convenience. Looking for a humanitarian corp - any suggestions? Have experience with market management? Expand your profits today by becoming a member of our team. Visit one of our recruitment officers in the Red Steele channel today. Looking for something new? Speak to our staff today. Speak to one of our officers today about your next opportunity! A friendly reminder to the cluster - I-RED is recruiting! Enjoy industrial operations or combat patrols in Syndicate with us today! Check out our GalNet Site for information on our organization. The Ishukone-Raata Industrial Partnership [I-RIP] corporation has been formed with the intent to take advantage of the upcoming moon mining infrastructure changes. If mining is your interest, seek us out for new opportunities. With the addition to the Upwell Refineries, the Ishukone-Raata Industrial Partnership (I-RIP) is now looking for capable pilots willing to brave null-security space. Still looking for invested individuals. Ishukone-Raata is recruiting in all timezones. Need industrialists and PVP pilots. I-RED is recruiting. We offer moon mining, PVP and a great nullsec experience. Check us out in game at RED STEELE. Small gang warfare + some cap fights. Syndicate PVP. Contact us in game at RED STEELE for for a chat. I-RED still recruiting. Industrialists and PVPers. Syndicate based. 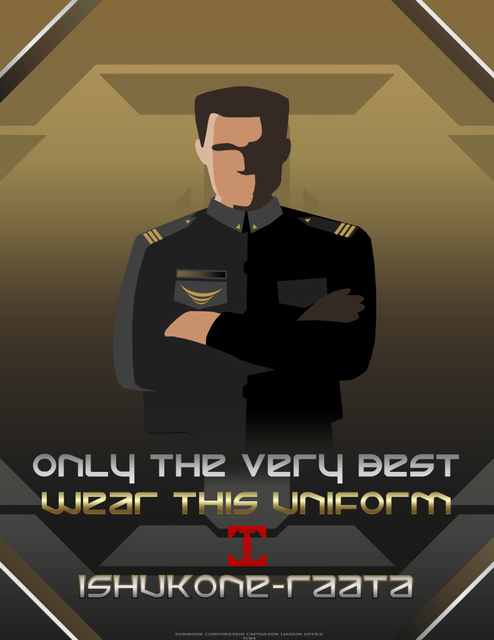 Ishuk-Raata is recruiting corporations and pilots alike. Seek us out for new exciting employment opportunities.